Do cute animals get better protection? Worms have been denied, wolves could be cut out, but some sea turtles could be added to the U.S. Endangered Species List. 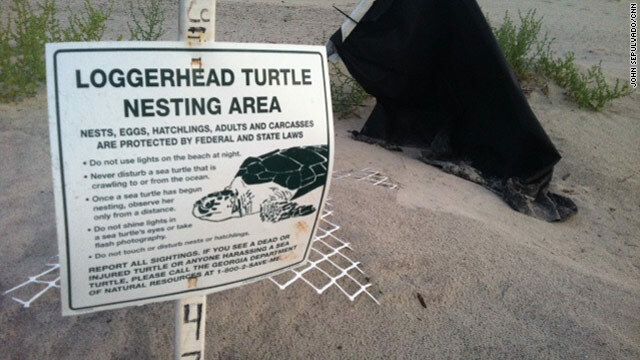 A push to add the loggerhead sea turtle is bolstered by several studies that say they could be extinct in the middle of the century. Besides natural predators, boat strikes, fishing and dredging, baby loggerheads have to contend with humans who see them and illegally take them home, thinking they can take care of them. The Tybee Island Marine Science Center in Georgia says it hears about this happening often. “(People take them) because they’re so cute," said Lauren Broome, a marine biologist at the center. "When they’re hatched, they’re about … 2 inches." But do cuter animals like the loggerhead have an easier time getting on the endangered list than creepier or more menacing creatures? Patrick Gallagher, director of the Sierra Club’s Environmental Law Program, says cute or charismatic animals can have an easier time, politically, getting protections from federal officials. Japan's nuclear safety agency will be placed under the control of the country's Environment Ministry, a top government official announced Monday in a move stemming from the triple meltdown at the Fukushima Daiichi power plant. Monday's decision will take the day-to-day regulation of nuclear plants out from under the Ministry of the Economy, Trade and Industry, which has promoted the use of nuclear energy, Chief Cabinet Secretary Yukio Edano said. The agency has been tentatively designated the Nuclear Safety Agency, but Edano said he and other Cabinet members hope to add the word "regulatory" to the name before long. A 50-year-old man accused of strapping a fake bomb on an 18-year-old woman in Sydney, Australia, earlier this month was arrested Monday in Louisville, Kentucky, said Australian law enforcement officials. A judge ruled Monday that there was enough evidence to continue holding a U.S. man in connection with the case of a missing American woman, Aruba's solicitor general said. The decision to hold Giordano for 16 more days was issued after a jailhouse hearing Monday afternoon, Aruban Solicitor General Taco Stein said. An official with San Francisco's rapid transit system stood by the decision to shut off cell phone service ahead of a protest, not ruling out a similar move in response to a planned demonstration Monday. The decision drew widespread criticism and stirred the well-known hacking group Anonymous to stage an "operation" Sunday. The group urged those supporting its cause to attend a "peaceful protest" Monday. The FCC says it is investigating the matter. Author Alisa Harris, left, and Republican presidential candidate Michele Bachmann. 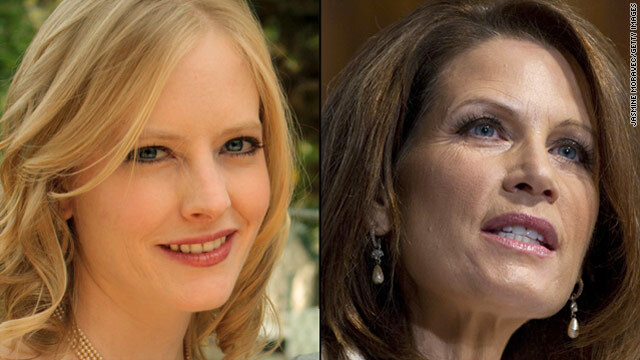 From the way writer Alisa Harris describes it, she and Michele Bachmann could have been sisters. Harris, author of the forthcoming book "Raised Right: How I Untangled My Faith From Politics," says they shared similar family upbringing and education. But unlike Bachmann, Harris says, she began to doubt what she had been taught. "I began to think that our Christian duty was not to make our country’s laws conform to our private morality but to heal the broken-hearted and bind up their wounds." As with many Belief Blogs, CNN.com readers were divided over religion and its place in politics. Damian said, "Great article! Very interesting how you came around. Thank god! Too bad we can't say that for Bachman. Hopefully most of the U.S. will realize how extreme she is and that she isn't focused on the right things." tallulah13 said, "I find it amazing that so many 'Christians' vilify this woman for turning away from her childhood indoctrination in an attempt to follow the teachings of Christ. It says a great deal about the state of Christianity in this country that so many are more interested in calling the author names than they are in considering the value of her words." A para-swimmer featured in a CNN.com story last week has broken another world record, making her the world record holder or current world champion in all individual swimming events to be held in her class at next year’s Paralympics. One of her U.S. teammates also made a historic splash at the Pan Pacific Para-Swimming Championships in Edmonton, Alberta, setting four world records of her own in a separate physical ability class. 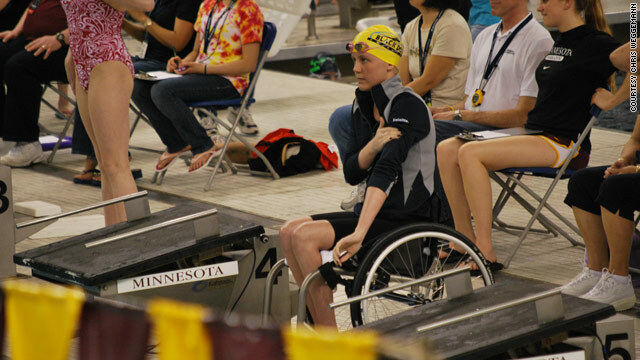 Mallory Weggemann (pictured), 22, of Eagan, Minnesota, and Jessica Long, 19, of Baltimore, Maryland, each collected eight gold medals at the event - one of the last major meets before the 2012 Paralympics - from Wednesday to Sunday. 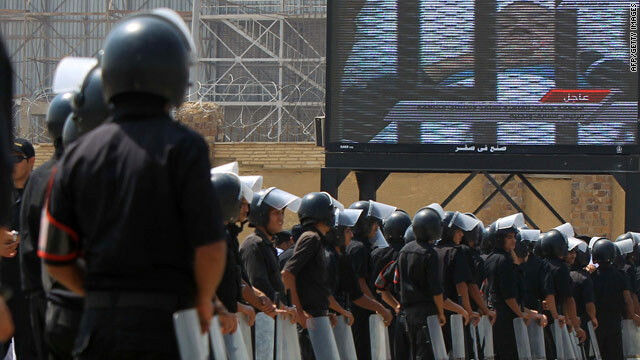 Police stand guard Monday outside court in Cairo as they watch the televised trial of ousted Egyptian President Hosni Mubarak. The trial of Hosni Mubarak: Revolutionary justice or 'revolutionary crack'? “I hope they hang Mubarak today,” my neighbor told me, by way of a morning greeting. These are strange times in Egypt. With sporadic breaks, I’ve spent most of the last six months with my head buried deep in the sands of Libya, but now I’m back in Cairo, my home, on the day when deposed President Hosni Mubarak made his second appearance at a trial held in what, not long ago, was the Mubarak Police Academy. Now it’s simply the Police Academy. Modern Egypt’s longest ruling leader, a man once dubbed “the Pharoah,” is behind bars in the defendant’s cage, where so many of his critics ended up. Lying on a mobile hospital bed in a dark track suit, his once imperial aura had faded, though not his hair dye. In the cage, he looked more bored than bowed and didn’t seem to be paying much attention to the proceedings Monday. For decades, Mubarak symbolized the monolithic Egyptian state. He was the aloof, visionary leader who, the state-run media was wont to suggest, saw and understood what the common folk could not begin to comprehend, the towering father figure who knew best, and should be obeyed, and, just as importantly, applauded. For many Egyptians, however, the 83-year-old president was the out-of-touch, arrogant autocrat sitting atop a pyramid of oppression, corruption, cronyism and brutality. How much real power the aging, ailing Mubarak had in the day-to-day running of the country is not clear. It was widely believed that powerful figures behind the throne, including former Egyptian spy chief (and very briefly vice president) Omar Suleiman and Interior Minister Habib Adli, were calling the shots. Likewise, many Egyptians believed Mubarak’s wife, Suzanne, and son Gamal were also key power brokers. In minutes from his interrogation leaked to Egyptian media, Mubarak is reported to have said, "No one would have paid any attention to me or my orders" if he had demanded an end to the often violent crackdown on anti-regime protesters this year. The revolution put an end to Mubarak, but little else has been resolved. "Braydon, buddy, from your extended Army family, we just want to let you know that we had the privilege of serving with your father," Army Capt. Jamie Schwandt said Monday on "CNN Newsroom." "We found out first-hand just how great of a person your father really was. "He loved you so much," Schwandt continued, his voice breaking. "He talked about you all the time. You should be extremely proud of him." Braydon, with the help of his mother, Jessica Nichols, of Kansas City, Missouri, posted an iReport just hours after learning that Bryan Nichols had died. She and her son were watching television news reports that showed photos of other men who died, and the boy asked his mother why there were no pictures of his father. Braydon wanted to change that, so he and his mother went to CNN.com to post the iReport, which included a picture of Bryan Nichols. CNN.com published a story about that iReport. The response from CNN's audience was immediate, massive and heartfelt. More than 54 pages of iReport tributes have poured in - more than 250 - to CNN.com. There have been dozens of notes to the boy on Bryan Nichols' Home and Away page. Some of those messages are from fathers who sent photos of them hugging their own young sons, writing that the story of Braydon's loss broke their hearts. Many readers wrote CNN.com to say that the story of the American boy losing his dad minimized their everyday personal problems. Others wrote to say that they had also lost a loved one during wartime. Jessica Nichols told CNN.com that the child continues to read every message, and he understands that a lot of people are offering their support to him and other children whose parents have been touched in some way by the nearly 10-year war. As Libyan leader Moammar Gadhafi urged supporters to take up arms and battle rebel forces Monday, a senior member of Gadhafi's government arrived in Cairo amid rumors that he had defected, Egypt's state-run Al-Ahram newspaper reported. Nasr al-Mabrouk Abdallah arrived with nine of his family members on a private plane from Djerba, Tunisia, the newspaper reported, citing an unidentified airport official. Djerba is about 150 miles (240 kilometers) west of Tripoli. Libyan Embassy officials did not greet the plane when it pulled up to Terminal 4, which is the arrival point for private planes, fueling speculation that Abdallah may have abandoned Gadhafi, the newspaper said. Al-Ahram and an official at Cairo International Airport identified Abdallah as Libya's minister of the interior. But a Libyan government official - whose information has proved reliable in the past but who is not allowed to talk to the news media for attribution - identified Abdallah as an administrative director at the Interior Ministry and a former Libyan minister. 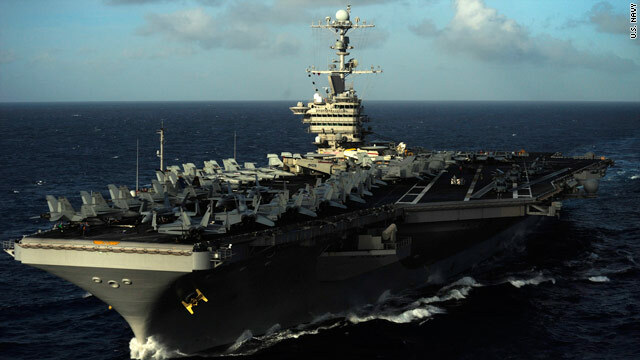 The USS John C. Stennis is a Nimitz-class carrier, one of 10 in the U.S. Navy fleet. With China’s first aircraft carrier completing sea trials this week, we thought it would be good to look at other countries that operate aircraft carriers. Aircraft carriers give nations so-called blue water navies, with the ability to project military power far from their nation's shores. The carriers often are good neighbors, too, as essential platforms for disaster relief and humanitarian assistance. Brazil: The Brazilian navy operates the Sao Paulo, a French Clemenceau-class light aircraft carrier it acquired from France in 2000. The Sao Paulo can carry up to 40 aircraft and operates with a mix of A-4 jets and helicopters. It was originally commissioned in France in 1963. France: The French navy operates the Charles de Gaulle, a nuclear-powered light aircraft carrier. The de Gaulle can carry 35 to 40 aircraft and about 2,000 personnel. It entered service in 2001. Most recently the de Gaulle has been supporting NATO operations over Libya. India: The Indian navy operates the INS Viraat, formerly the British carrier HMS Hermes, which it acquired in 1987. Viraat is a vertical short takeoff and landing carrier with displacement of almost 29,000 tons. It can carry up to 12 fighter aircraft and nine helicopters. Iraqi security forces inspect a site after an explosion in the northern city of Kirkuk after a series of bomb attacks across Iraq. 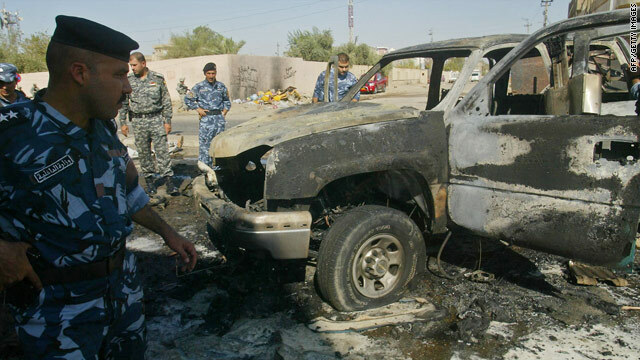 A barrage of deadly attacks struck across Iraq Monday, killing at least 75 people and wounding more than 250 others, Iraqi officials said. 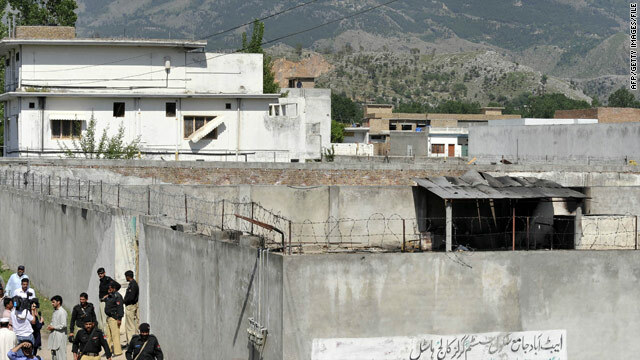 Twenty bombings and shooting incidents were reported. Some struck police and security forces, though a great many targeted civilians. Casualty reports from police, Interior Ministry officials, and health officials put the number of wounded at 252 by early evening. "Once again, murderers and criminals have carried out attacks against innocent civilians to add a new page to their black criminal record," Iraqi Prime Minister Nuri al-Maliki said in a statement. He called on security forces to "not let the killers catch their breath," and pursue them "until they finish them." It was the worst wave of violence to strike the country in months, taking place on the halfway mark of the Muslim holy month of Ramadan. "Today's attacks are eerily similar to the stream of large scale, complex attacks that occurred here last year during Ramadan on Aug. 25," said Maj. Angela Funaro, spokeswoman for United States Forces-Iraq. 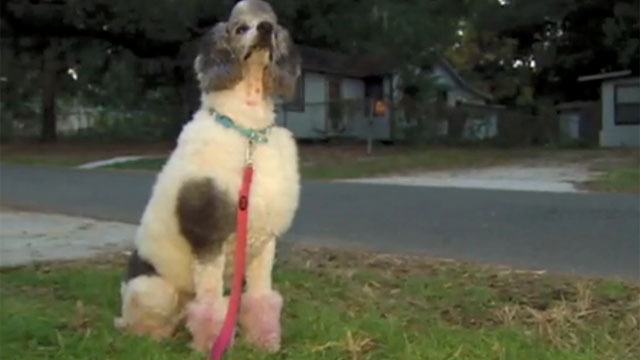 A Florida city busted a dog owner who dyed her pooch's paws pink. Money Magazine has released its 2011 list of America's 100 best places to live. In today's Gotta Watch, we're checking the map and looking at a few other cities you may - or may not - want to consider. Buford, Wyoming's party of one - Whether it's about winning debates at town meetings, the length of his commute or how long it would take to meet the entire population, Don Sammons knows all the jokes. And he should. He's the sole resident of Wyoming's oldest town. Lynwood, Washington's men in tights - If safety is at the top of your list, you may want to consider Lynwood, Washington. The city's police force gets a little extra help from a merry band of crime fighters. Jacksonville, Florida's pet peeve - If you want a city that supports all forms of creative expression, even when it involves the family pet, you may want to drive on past Jacksonville, Florida. Just ask this woman, who was busted for painting her pooch. 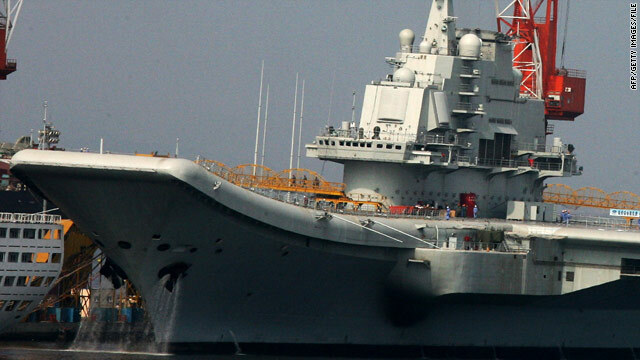 China's first aircraft carrier is shown in port in Dalian on August 4. China's first aircraft carrier was back in port Monday after completing four days of sea trials. Seven tugboats pulled the vessel, a platform China acquired from Ukraine, into the port of Dalian on Sunday morning. The carrier's radar was visible, but weapons systems were concealed under sheets, the Xinhua News Agency reported. A Chinese military expert told the People's Daily Online that the radar system, called the "Chinese Aegis" in reference to its sophisticated U.S. Navy counterpart, is one of the most advanced deployed by any navy. Clothing found during a search of Aruba's phosphate mines does not belong to a missing American woman, Aruba's solicitor general said Monday. The clothing was discovered Friday when crews were searching for Robyn Gardner, 35, who has been missing since August 2. A U.S. man being held in connection with the case is set to appear in court Monday, said Aruban Solicitor General Taco Stein. A judge could order Gary Giordano, 50, held for at least eight more days, order him to remain on the island or release him due to a lack of evidence, according to Stein. Giordano was arrested by Aruban police on August 5, three days after Gardner was last seen near Baby Beach on the western tip of the Caribbean island. Giordano's attorney urged authorities on Sunday to release his client. "Today, nine days later, four voluntary interviews, two site visits, and more than 30 statements coming from different sources including witnesses and professionals, we can not deduce that there is hard proof to sustain a demand by the public prosecutor against our client," Giordano's attorney, Michael Lopez, said in a written statement. "In anticipation of any possible reason of prolongation of the client's detention, we can state that no felony has been committed by him," Lopez said. "The Department of Justice at this time does not have any basis to request prolongation of his detention." According to Aruban prosecutors, the missing woman and the suspect arrived on the island July 31 from the United States. Lopez said last week that his client came to Aruba on vacation with a female friend he had met on a dating site and has known for years. Giordano told authorities that he had been snorkeling with Gardner, when he signaled to her to swim back, according to a statement from the prosecutor's office. When he reached the beach, Gardner was nowhere to be found, he allegedly said. Stein said Monday that Aruban authorities are holding Gardner's passport so it is not possible that she has left the country. Lopez denied statements by prosecutors that his client is no longer cooperating with authorities in the investigation. American Amanda Knox is appealing her murder conviction in the 2007 death of her roommate Meredith Kercher in Italy. There’s been no shortage of speculation about what took place the night in 2007 when American student Amanda Knox’s roommate was murdered in the house they shared in Perugia, Italy. Whether the case is playing out in court or not, the speculation about whether Knox was responsible for the death of her roommate Meredith Kercher rages on - in Italy, the United Kingdom and the United States. Knox was sentenced to 26 years in prison, and her Italian boyfriend at the time, Raffaele Sollecito, was sentenced to 25 years for murder. The question everyone asks: What really happened inside that house, and is Knox responsible? The questioning of the verdict comes in many forms: How do the cultural and judicial differences between Italy and the U.S. and UK change the way we view the case? Part of the answer has come from the case's new momentum as Knox’s attorney presented evidence during his client's appeal of her murder conviction challenging Italian police forensic operations. Forensic expert Patrizia Stefanoni and her team examined DNA evidence during the original investigation in 2007. Their work has been strongly contested by two court-appointed forensic experts, professors Carla Vecchiotti and Stefano Conti. The professors argued that two key pieces of evidence in the conviction of Knox and Sollecito should have been considered inadmissible. Knox's supporters say they hope her conviction may be overturned or her sentence reduced on appeal. CNN Radio's John Lisk spoke with journalist Nina Burleigh about her new book, "The Fatal Gift of Beauty: The Trials of Amanda Knox" (Broadway), which takes a look at why this case has captured the attention of so many people. Casey Anthony and her legal team will appeal the order that would force her back to Orlando to serve supervised probation, her attorney Jose Baez told CNN. On Friday, Orange County Chief Judge Belvin Perry Jr. ruled that Casey Anthony must serve one year of supervised probation for a check-fraud conviction. She is required to report no later than noon on August 26. Perry also ruled the Department of Corrections can keep Anthony's address confidential to safeguard her well-being. Citing reports indicating Anthony is highly disliked by the public, the judge acknowledged that there "is a high probability that there are many that would like to ... physical(ly) harm" the defendant. The probation order states that Anthony cannot leave "the county of (her) residence" - which has been Orange County - without her probation officer's approval. The disappearance of Robyn Gardner has brought the international media back to Aruba, and Arubans aren’t happy about it. After the prolonged investigation without resolution in the Natalee Holloway case the summer of 2005, tourism took a hit. The locals are nervous and not keen to see us again. There is no way to keep a low profile on an island when you’re CNN. A photograph of us reporting in front of the prosecutor’s office was on the front page of the island’s most popular paper, The Diario, the day after we landed. That’s an extreme example. I have been here many times, and always, unfortunately, for bad news. I was here for much of the Holloway frenzy, but even now, I find most here are extremely polite and friendly. However, if you ask them if they know anything about the current case and would they be willing to be interviewed, people grow silent. Twice my requests were met with the same response. One person said “here is someone who could talk" to me while writing down a name and phone number. Only it was the number for the island’s solicitor general, and I already had it.